YOU HAVE TO KILL THIS BEAT!! I MEAN, PLEASE PUT SOME TIME INTO IT, YOU HAVE UNTIL FEB. 21ST TO FINISH YOUR VERSE/VIDEO. TAKE TIME TO RECORD HOWEVER LONG OF VERSE, HOOK, (OR NO HOOK), ETC.. IT DOESN'T MATTER... AND GET IT DOWN THE WAY YOU WANT IT... JUST DO YOUR BEST AND IT WILL GET NOTICED!! I WILL BE JUDGING THIS COMPETITION MYSELF...AND I AM VERY PICKY ON TIMING AND DELIVERY ESPECIALLY!! 1. GO PREVIEW THE BEAT HERE! 2. DOWNLOAD THE INSTRUMENTAL HERE! "COMMENT" ON THE CONTEST VIDEO HERE! 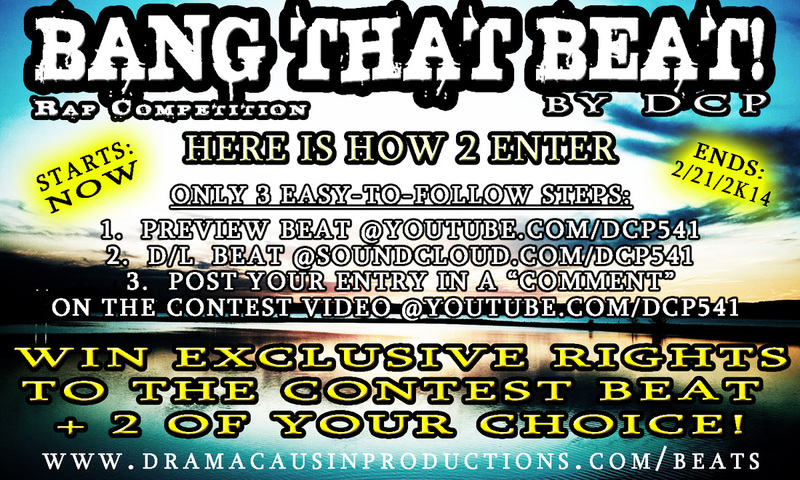 I WILL BE OFFERING THE ARTIST WITH THE BEST VERSE OVERALL THE FULL EXCLUSIVE RIGHTS TO THE CONTEST BEAT, AS WELL AS 2 MORE EXCLUSIVE BEATS MADE BY MYSELF (DCP) FROM MY BEAT STORE HERE! TO COMPLETE YOUR ENTRY, YOU MUST MAKE SURE YOU POST THE LINK IN A "COMMENT" ON THE CONTEST VIDEO... AND THAT VIDEO ONLY! !